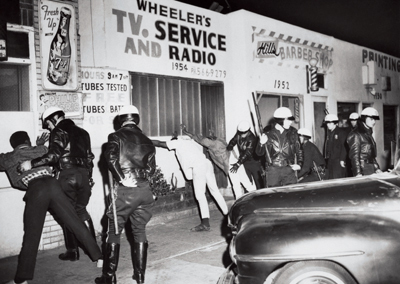 Police searching neighborhood residents during an outbreak of unrest in Watts, Los Angeles, March 15, 1966. Photo: Bettmann/Corbis. In other words, the vociferous denial of a connection between 1968 and 2005, if taken as symptomatic of a repression, would seem to be a cue that in fact the nature of this association is precisely what we can and must explore. While being mindful that the two events should not be collapsed into a single phenomenon, we might nevertheless ask: What do the casseurs of today’s suburban ghettos share with their predecessors of 1968? The answer, the fundamental commonality, is a shared spatial dynamica dynamic analyzed presciently in L’Irruption de Nanterre au sommet (The Irruption: From Nanterre to the Summit) by Henri Lefebvre. Though hardly the famous sociologist’s best-known work among English-speaking readers, this little book is worth returning to now, establishing as it does a point from which connections radiate in various directionslinking theory and praxis, past and future, the colonies and the métropole, into a kind of provisional history of modern revolt. He would know. Lefebvre had left the University of Strasbourg in 1965 to join the sociology faculty at Nanterre, which boasted a number of progressive intellectuals, including fellow sociologist Alain Touraine (who would go on to coin the term postindustrial society) and Jean Baudrillard (Lefebvre’s assistant at the time). So when the campus became a hotbed of agitation in the months prior to May 1968, Lefebvre had a privileged position from which to observe its unfoldingalthough he can hardly be considered a mere passive spectator. His place within the leftist community at Nanterre was complicated. His seminars on the “bureaucratic society of controlled consumption,” whose contents are reflected in his abundant publications from the period, clearly provided a vocabulary with which to describe the new forms of alienation and its contestation emerging among the students.⁴ At the same time, though, Lefebvre’s lectures were subject to ever more disruptive interventions by the self-styled enragés of Nanterre, who saw him as an academic “recuperator” of radical theory, and who showed their displeasure by interrupting his lectures with catcalls and well-aimed tomatoes. Despite this sometimes fierce hostility, his sympathies unmistakably remained with the student activists, and in the immediate aftermath of the May eventswith the acrid smell of tear gas still in the air, as it werehe penned a series of short essays analyzing society, state, and ideology in light of the revolt. First appearing in the pages of the sociology journal L’Homme et la société, they were collected as L’Irruption and published in France in fall 1968. Detail of a page from Internationale Situationniste 10 (March 1966). Guy Debord, “Le Déclin et la chute de l’économie spectaculaire-marchande” (The Decline and Fall of the Spectacle-Commodity Economy). The book soon appeared in English as The Explosion: Marxism and the French Revolution, a translation that, if lacking in subtlety, is certainly more memorable than a straight rendition of the French (although one regrets the loss of irruption’s connotation of an irresistible breaking-through, of flooding and inrushing flow, in favor of the insistent verticality of explosion). The American publisher, New York’s Monthly Review Press, has reissued the book, long out of print, in conjunction with the fortieth anniversary of May ’68. One can only hope that it finds a more sympathetic reception this time aroundwhen it was published in 1969, it received tepid reviews at best. Historian E. J. Hobsbawm’s description was typical: For him, Lefebvre’s book had “not much to do with the events of May,” which it used “chiefly as a peg for hanging the . . . Hegelian-Marxist observations” of its author.⁵ Not an altogether inaccurate assessment, perhaps, but then again, Lefebvre wasn’t attempting to write a history. His aim, rather, was to compose an “essentially political” analysis, as he explains in The Explosion’s opening pages. And while some passagesthe rather tedious accounts of Marxist theory, the arguments with Herbert Marcuseare dated, at the core of this small book are pages that remain striking. At its best, Lefebvre’s thought captures that blend of theory and poetry, of Marxism and surrealism, characteristic of the student movement of ’68. However, if we turn back to Lefebvre now, it is not simply out of nostalgia for those turbulent days but because his analysisbased finally on a desire to ground political debate at the level of the senses, of the immediately livedbears directly on our own circumstances. Following this logic, we could say that heterotopy is the linguistic equivalent of uneven development in the capitalist economy. If the latter accounts for lags and imbalances between sectors of society, the former is an account of lags and imbalances between signifying units and of the dominance of core, isotopic meanings over peripheral, heterotopic ones. And indeed, in The Explosion, Lefebvre returns to the law of uneven development as a means of parsing the increasing complexity of the contemporary world. We shouldn’t be surprised to find cities, which themselves may be understood as texts of a kind, structured along similar lines, with well-integrated centers and concentrations of wealth and capital alongside marginal, segregated ghettos of various sorts. Hence Nanterre, with its university ghetto hard by the North African bidonville, both pushed out to the suburban belt beyond Paris. The city in the West, from the ancient world onward, had represented humanity’s quest for perfection, had been the very basis of civilization, Lefebvre writes; but Nanterre, by contrast, “might be described as a place of damnation.” Unlucky students and foreigners alike were excluded from the paradise of the city, confined (though under very different conditions, of course) to this space of perdition. DEBOUT LES DAMNÉS DE NANTERRE! (Arise, you wretched of Nanterre!) read one of the most famous lines of graffiti adorning the university walls in the spring of 1968. Nanterre, France, 1968. Photo: Henri Cartier- Bresson/Magnum. And while Lefebvre does not so much as mention Fanon in The Explosion, the great theorist of decolonization seems to have provided him with one set of terms for understanding the nature of contemporary French society. The “wretched of Nanterre” was not simply a gratuitous analogy. As Lefebvre remarks, once the postwar process of decolonization had begun in earnest, advanced capitalist economies embarked on a program of internal colonization, concentrating on their domestic markets “in order to utilize [them] according to a colonial pattern.” Thus, the colonial experience had been carried “into the midst of the erstwhile colonizing people.” As it had for Fanon, for Lefebvre this social arrangement had important spatial correlates: “The population in the metropolis is regrouped into ghettos (suburbs, foreigners, factories, students), and the new cities are to some extent reminiscent of colonial cities.” Nanterre stood, as a city of the colonized, in a position of radical exclusion from Paris as urban center, with its concentrations of decision making, power, and wealth. The Commune is another important historical current informing Lefebvre’s reading of 1968. His 1965 book La Proclamation de la Commune offered a spatial analysis that prefigured The Explosion, as well as Le Droit à la ville (The Right to the City), an extended essay he published early in 1968. La Proclamation de la Commune had also proposed four great forces at work in the popular uprising that convulsed Paris in 1871: the demonstration of a widespread, creative spontaneity; the concrete transformation of everyday life; the emergence of that free society, without fixed organization, dreamed of by Charles Fourier and the French utopian socialists of the nineteenth century; and, finally and above all, collective festivity.¹⁰ Lefebvre would reprise each of these themes in The Explosion, positing them as central to the events of May. At this point, a consideration of The Explosion leads us back to the group of artists, architects, and theorists so inextricable from any discussion of May ’68. All of Lefebvre’s thinking on and around the Commune owes a particular debt to ideas developed among the members of the Situationist International; in fact, it was Lefebvre’s study of the Commune that precipitated his falling-out with the SI over accusations of plagiarism. In 1962, in the wake of discussions on the subject, he had asked Guy Debord, Attila Kotányi, and Raoul Vaneigem to draft a few pages clarifying their views of the events of 1871, which he proceeded to publish in the journal Arguments under his own name as an excerpt from his forthcoming book. Today, this question of intellectual priority seems obscure, but there can be little doubt that the Situationists were in large measure responsible for the currency of these ideas in 1968. Lefebvre, for his part, had insisted rather strenuously on the purely historical significance of his theorization of the Commune, taking the SI to task in 1967 for promoting the idea of festive revolution in words he would soon regret: “Do they really imagine that one fine morning or one decisive evening people will look at each other and say: ‘Enough! Enough toil and boredom! Let’s put an end to them!’ and that they will join the everlasting Festival and the creation of situations? If this happened once, at dawn on 18 March 1871, this conjuncture will not recur again.”¹¹ The Explosion reads, at least in part, as atonement for this statement, a kind of self-critique prompted by the scrutiny of history’s tribunal. If Lefebvre was running to catch up with history as he feverishly penned this book early in the summer of 1968, he was also, then, running to catch up with the Situationistswho, perhaps unsurprisingly, go unmentioned in the text. Despite that silence, however, The Explosion is profoundly obliged to the SI; it is another leg in the intellectual relay Lefebvre and the group were engaged in throughout the decade. 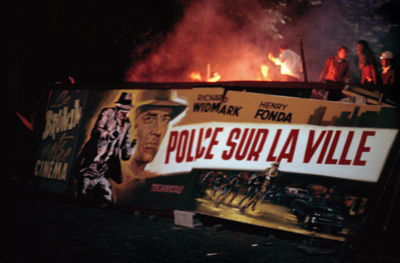 Barricade, Paris, May 1968. Photo: Bruno Barbey/Magnum. Certainly, Fanon’s vision of the Manichaean divisions of the colonial world, and the figure of the Commune as festive reappropriation of urban space, are interpretive frameworks that had been articulated in the pages of the journal Internationale situationniste prior to 1968. To trace them to the specific text in which they converged is to locate an important correspondence between May ’68 and an earlier, American upheaval: the Watts riots of August 1965. 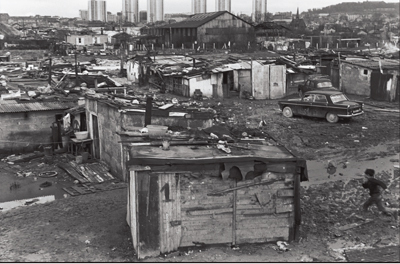 In his brilliant analysis of the Los Angeles revolt, published in the journal in 1966, Debord claimed that what had happened in Watts was no mere protest against poor living conditions, inadequate education, or high unemployment; the black residents of the LA ghetto were not asking to benefit equally from the promises of America’s much-touted society of abundance, so much in evidence in nearby Hollywood and Beverly Hills. The looters, he wrote, “take at its word the propaganda of modern capitalism, its advertising of abundance,” and were demanding precisely what that system could not provide within its own terms: the immediate satisfaction of desires. Like the colonial subject who, per Fanon, turns on the white settler’s city “a look of envy” that expresses “his dreams of possession,” the Watts rioters, said Debord, “want all the displayed and abstractly available objects at once.”¹² But Debord went further than Fanon with this claim: The looters yearned not simply for possession but for expenditurerejecting the commodity and exchange-value, he claimed, “they want to use” and use up all that spectacle culture has to offer. When Debord evoked “the 2,000 counted fires, by which the pétroleurs of Watts illuminated their battle and their festival,”¹³ he was clearly drawing a comparison to the Commune of 1871 and its reclamation of the city by the working classes (including the mythical arsonists known as pétroleurs, after the cans of oil they reputedly used to set the buildings of Paris alight). The festival of the Commune had taught him to see the constructive appropriation of capitalist space in the methodical looting and burning of stores during LA’s nights of unrest. Further, it had taught him to understand these purposeful acts of vandalism as a refusal of the degraded urban ghetto (Lefebvre’s heterotopia) and as a tactic of transformation through destruction. 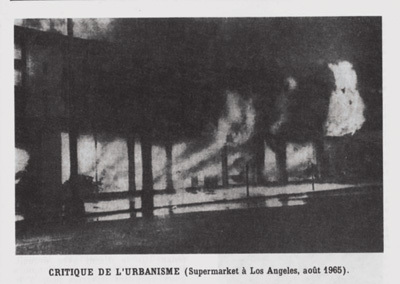 A photograph clipped from Time magazine and reproduced in Debord’s article had its original caption“Pillaged furniture store blazing out of control”replaced with a new one: “Critique of urbanism.” This was a realization of the themes approached in Lefebvre’s writing on the Commune’s history, and it in turn taught the enragés of Nanterre how that study might itself be deployed in the present. Things come full circlefrom theory to practice and back againin Lefebvre’s description of the fierce street battles between students and police in 1968, when, he writes, “the movement oscillated between urban celebration and violence, between playfulness and urban guerrilla warfare.” The violence of those weeks cannot be compared to that of the Commune’s final days, or that of Watts, but a structurally similar breakdown of the rigid hierarchies of urban space was at stake in each case. So what, then, is the currency of The Explosion? It resides, in brief, in the analysis of the emergence of new social actors from the sociospatial conditions of advanced capitalist society. For Lefebvre, modern society is characterized by a voidsimultaneously political, cultural, and ideologicalcreated by what he calls “absolute politics.” Absolute politics consists in the arrogation of power to an abstract and increasingly authoritarian state, and the concomitant marginalization of civil society. Between the two lies . . . nothing, a void, intermediary bodies having disappeared or been rendered ineffective. “The evil of this power derives,” Lefebvre writes, “from the fact that it is a malevolent force that destroys the social life surrounding it.” The result is that individuals, as well as social groups, are denied political agency and are completely transformed into “subjects” of power. The project of the student movement might be understood as a determination to fill this void in order to take part in true political debate and in order to, at the same time, expose the real nature of power. This is why the movement, starting from the university at Nanterrewhich Lefebvre deems a “negatively privileged” place because of its marginal character and its peculiar urban situationimmediately confronted the “top,” i.e., the Gaullist regime. It had, in this analysis, nothing else to confront, nowhere else to go. Nowhere, that is, but the streets. The institutions of French societythose political, cultural, and finally ideological “superstructures”having been eaten away from the inside by the logic of absolute politics, having been voided of any autonomy or independence from the state, the movement occupied the interstitial spaces of the city. “It was in the streets that spontaneity expressed itselfin an area of society not occupied by institutions.” Against the omnipresent political void, the “public” thoroughfare became politicized. Breaking out from imposed heterotopias, from socially and spatially marginal locales, the movement constructed a concrete utopia at the heart of the urban center. And there, Lefebvre writes, a new figure appeared on the political chessboard: Beside the “archaic” tendency (i.e., the conservatives) and the “modernist” one (the part of the movement, from the “liberal center” to the French Communist Party, that was content with reforming and more efficiently planning society) was the “possibilist” tendency, those who “view the ‘realm of possibilities’ as still open . . . proponents of the potential rather than the real” who “go so far as to proclaim the primacy of imagination over reason.” As the famous slogan spray-painted at the entrance to the Sorbonne amphitheater had it: ALL POWER TO THE IMAGINATION! Such expressions of utopian hope may seem foreign to our own, rather darker moment, but the logic of Lefebvre’s analysis still has lessons for the present, whether we are considering the alter-globalization protests of the past fifteen years or the events that set the banlieues on fire almost three years ago. In the latter case, Lefebvre’s discussion of the heterotopic situation of Nanterre resonates in the writings of Mehdi Belhaj Kacem, who contrasts the current situation of the banlieue with that of poor neighborhoods in the nineteenth century, which were still located within the city of Paris. The novelty of today’s banlieues, these spaces where the poor are penned up, he writes, is their radical exterioritythe ban- in banlieue signifying a place that is a non-place, a place under erasure, as it were. The pariahs who live there share with this space their defining trait: They are, like trash, at once exterior and interior to society. This paradoxical topological situation is precisely that of heterotopia.¹⁴ In this more recent instance, too, we can see the unexpected emergence of a political actor of great importance, a figure that comes into view precisely because the population of these suburbs has no choice but to react to the deployment of force organized by the state and charged with keeping a lid on things. Continual humiliation and harassment by a frequently racist police force has led to the invention of a new politics of resistance. And this situation is hardly unique to France. The crucial insight of Lefebvre’s writing is that the most important stake of social organization is precisely the way individuals live in their skins, they way they live in relation to society, with all their impulses, desires, and needs for pleasure and creation. Despite their apparent nihilism, the youth of the banlieue, no less than the members of the counterglobalization movement, are what he would have called possibilists: All are seeking to break out of the ghettos that a new and yet more stifling type of absolute politics has constructed at the margins of its isotopic centers of power. Tom McDonough is associate professor of modern architecture and urbanism in the Art History Department at Binghamton University. 1. This neoliberal effacement of May ’68 has ironically been abetted by the reluctance on the part of a segment of theorists of the Left to historicize the events, and a tendency to nostalgically exempt them from criticism. For an exception to this trend, see Kristin Ross, May ’68 and Its Afterlives (Chicago: University of Chicago Press, 2002). 2. René Viénet, Enragés and Situationists in the Occupation Movement (1968), trans. Loren Goldner and Paul Sieveking (New York: Autonomedia, 1992), 21. 3. Henri Lefebvre, The Explosion: Marxism and the French Revolution (1968), trans. Alfred Ehrenfeld (New York: Monthly Review Press, 1969). All quotes unless otherwise attributed are from this text. 4. Most significantly, Critique of Everyday Life (1947–81), 3 vols., trans. John Moore (London and New York: Verso, 1991–2005), which has recently been issued in a new paperback edition; and Everyday Life in the Modern World (1968), trans. Sacha Rabinovitch (New York: Harper & Row, 1971). 5. E. J. Hobsbawm, “Birthday Party,” New York Review of Books, May 22, 1969, 8. 6. Michel Foucault, “Different Spaces” (1967), trans. Robert Hurley, in Essential Works of Foucault, 1954–1984, vol. 2 (“Aesthetics, Method, and Epistemology”), ed. James D. Faubion (New York: The New Press, 1998), 178. 7. Lefebvre, Everyday Life in the Modern World, 162. Isotopy had been coined as a linguistic term two years earlier in A. J. Greimas, Structural Semantics: An Attempt at a Method (1966), trans. Daniele McDowell, Ronald Schleifer, and Alan Velie (Lincoln: University of Nebraska Press, 1983). 8. All quotes from Frantz Fanon, The Wretched of the Earth (1961), trans. Constance Farrington (New York: Grove Press, 1968), 38–39. 9. This is a succinct restatement of one of the central theses of Lefebvre’s study of the Commune, published three years earlier and avidly taken up by his most radicalized Nanterre students active in the numerous anarchist, Situationist, and revolutionary-communist “groupuscules” on campus, as was testified to by “Épistémon,” the pseudonym adopted by Didier Anzieu, one of Lefebvre’s colleagues at the Nanterre faculté. See his Ces Idées qui ont ébranlé la France (Nanterre, novembre 1967–juin 1968) (Paris: Librairie Arthème Fayard, 1968), 22. 10. Henri Lefebvre, La Proclamation de la Commune (Paris: Éditions Gallimard, “Trente Journées qui ont fait la France,” no. 26, 1965). 11. Henri Lefebvre, Position: Contre les Technocrates (Paris: Gonthier, 1967), 6. 12. Guy Debord, “The Decline and Fall of the Spectacle-Commodity Economy” (1966), in Situationist International Anthology, ed. and trans. Ken Knabb (Berkeley, CA: Bureau of Public Secrets, 1981), 155 (trans. modified). 13. Debord, “The Decline and Fall,” 153 (trans. modified). 14. In the manner of Giorgio Agamben’s homo sacer, from which Belhaj Kacem borrows. See Mehdi Belhaj Kacem, La Psychose française: Les Banlieues, le ban de la République (Paris: Éditions Gallimard, 2006).